On Monday, a whale rescue mission got deadly. On Monday, fisherman Joe Howlett was killed by the very whale he freed from a fishing net, the Canadian Press reported. The 59-year-old Campobello Island, Canada, fisherman had a long history of whale care: over the past 15 years, the fisherman had rescued around two dozen whales. His knowledge of ropes and fishing lines, he said in 2013, made him the perfect candidate to save these entangled whales. “I’m a fisherman and I’ve been fishing for half of my life, and I know what it’s all about with ropes and things like that,” he told the CBC. But knowledge alone cannot override chance. On the day of his death, Howlett boarded a ship in order to untangle a North Atlantic right whale from shipping nets. 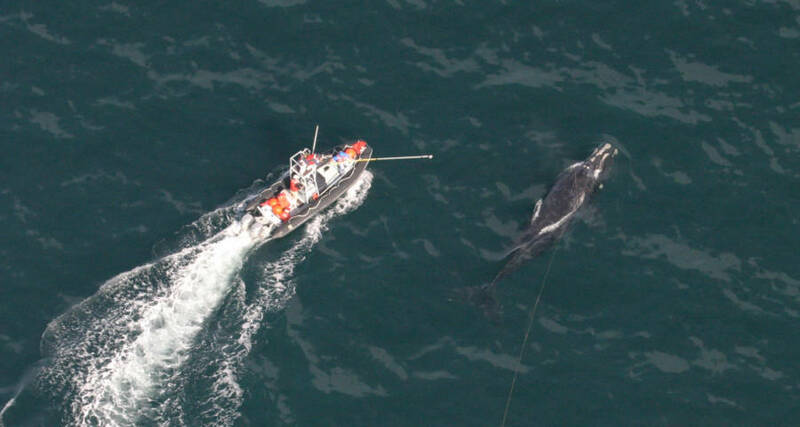 This whale was of particular significance to Howlett: seven north Atlantic right whales had been killed that month, a devastating blow for an endangered species whose numbers have steadily dwindled to a population of just 525 whales. After Howlett cut through fishing lines to free the large animal, it became alarmed and flipped. In the process of doing so, the whale struck Howlett, killing him. “They got the whale totally disentangled and then some kind of freak thing happened and the whale made a big flip,” Mackie Green of the Campobello Whale Rescue Team told the Canadian Press. Back in the 18th and 19th centuries, the right whales’ docile nature and high blubber content made them a prime target for whalers, which led to their low population today. At one point in the 1930s, the whales’ population plummeted to just 100. Over the ensuing decades — and largely thanks to individuals like Howlett — their numbers have increased. Those who know Howlett believe that he would want whale rescue projects to continue, no matter the risks. Next, read more about the dangers that marine mammals face from human pollution with this story about a killer whale that was “One Of The Most Contaminated Animals On The Planet”. Then, witness the immense power of killer whales in this video of them ripping a whale to shreds. Monks Find Ancient Prescription Made By The "Father Of Modern Medicine"